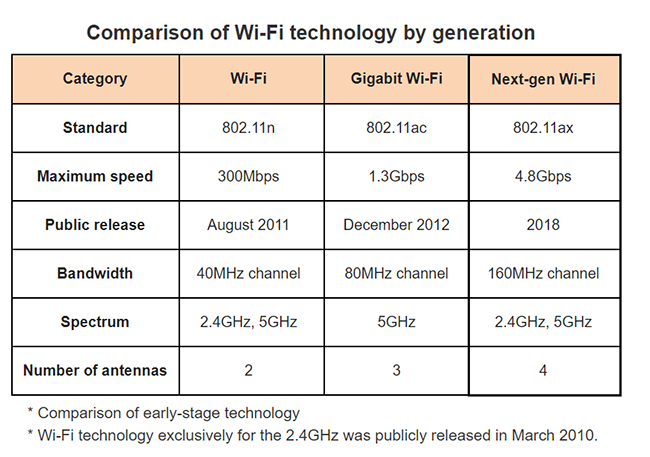 SK Telecom is preparing to launch a next-gen public Wi-Fi service based on the 802.11.ax, which offers up to 4.8 Gbps per AP. This is about four times faster than the Giga Wi-Fi (802.11ac Wave1, 1.3Gbps) that SK Telecom first commercialized in 2013. 'T Wi-Fi AX' uses four antennas to transmit and receive radio waves, and the available frequency bandwidth is 160MHz, which is twice the conventional Wi-Fi. The 2.4GHz and 5GHz frequency bands are used. The latest Samsung Galaxy smartphones are equipped with 802.11.ax chips, and SK Telecom anticipates that other models will be as well. "T Wi-Fi AX" is the first in Korea to utilize commercial APs that have been officially certified by the government. The AP received an electromagnetic compatibility certification from the National Institute of Advanced Industrial Science and Technology (AIST) at the end of August and final equipment approval from the Ministry of Information and Communication. 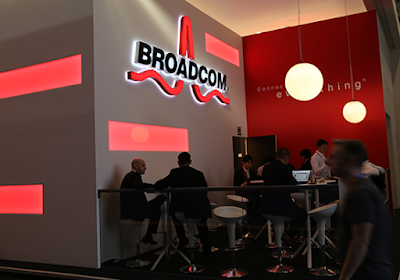 Broadcom has begun mass production of its WiFi 802.11ax SoC, the first in the industry to be fully compliant with the IEEE 802.11ax specification and the upcoming 802.11ax certification. 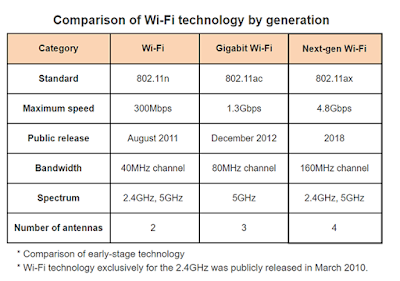 The BCM43684 Max chip, which is Broadcom’s sixth generation Wi-Fi silicon, is aimed at the residential Wi-Fi market. NETGEAR is using the SoC with its Nighthawk product line. SK Telecom Co. has named three vendors for its 5G network: Samsung Electronics, Ericsson, and Nokia. Huawei and ZTE were notably excluded. SK Telecom said it is on track to launch commercial 5G service in early 2019. Arista Networks has acquired Metamako, a start-up specializing in low-latency, FPGA-enabled network solutions. Financial terms were not disclosed. Metamako is based in Sydney, Australia and was founded by Scott Newham, Dave Snowdon and Charles Thomas, who have a background in ultra-low latency hardware, software and algorithmic trading. Metamako offers a layer 1 switch specifically designed for latency-sensitive applications such as trading. Arista said the acquisition will play a key role in the delivery of next-generation platforms for low-latency applications. Broadcom introduced a 200G Ethernet controller with 50G PAM-4 and PCIe 4.0. The new "Thor" device, which builds on Broadcom's widely-deployed NetXtreme E-Series architecture, combines a high-bandwidth Ethernet controller with a unique set of highly optimized hardware acceleration engines to enhance network performance and improve server efficiency. Broadcom is offering Thor dual-port 100G PCIe NICs and single-port 100G OCP 2.0 Mezzanine cards. Sampling is underway. "I am excited we are bringing Thor to market just as customers pivot to 100G and higher throughputs," said Ed Redmond, senior vice president and general manager of the Compute and Connectivity Division at Broadcom. "Being first to deliver a fully-featured, fully-accelerated, high-performance 200Gb/s Ethernet controller that features market-leading accelerators such as TruFlow, Broadcom's Thor is key to the industry's adoption of 100G and unleashing the power of our customer's cloud and enterprise data centers." Polaris Wireless, which supplies software-based wireless location solutions, has demonstrated the ability to locate wireless devices in the vertical dimension, or z-axis, within one floor level. Polaris Wireless leverages available sensor inputs from devices and wireless networks to determine location. The company said its latest release also improves indoor horizontal accuracy. The company also released the following highlights from its recent participation in the CTIA’s Test Bed LLC Stage Z independent vertical location testing, which evaluated barometric-based solutions. The FCC's Stage Z testing was conducted in San Francisco, Atlanta, and Chicago. Polaris Wireless was one of two technology vendors selected to participate and was the only solution tested in all buildings in all cities. Polaris Wireless included the widest variety of device and barometric sensor manufacturers. The other participating technology vendor is a hardware-based solution requiring terrestrial beacons and firmware in devices. The Polaris Wireless solution was tested in 3 cities, 48 buildings, 312 test locations, and 55,592 test calls. Polaris Wireless achieved a vertical accuracy of 4.8 meters at the 80th percentile, with a minimal one-time compensation of the barometric sensor outside of the test cities. Using actual test call data to emulate active sensor compensation, the Polaris Wireless solution improved to 2.8 meter accuracy at the 80th percentile, which exceeds the generally-accepted definition of floor level of under 3 meters. Polaris Wireless achieved 25.8 meters of horizontal indoor accuracy at the 80th percentile, an improvement of 38% from CTIA’s Test Bed Stage 2 indoor testing for emerging technologies conducted in 2016. Zayo announced that aan international carrier has selected it for a pan-European dark fiber backbone. The name of the customer was not disclosed. Zayo said this dark fiber project includes a nearly 3,500 route-mile network with dozens of ILA stations, connecting four major European markets. It leverages Zayo’s in-place network in the U.K. and Western Europe. The solution supports the carrier’s European expansion, providing capacity and latency advantages. The carrier connects to Zayo’s network via subsea cables in Marseille, a strategic gateway and intercontinental aggregation point. Zayo provides diverse fiber routes from Marseille that connect to Paris, Frankfurt, London and other European markets. Wasabi, a start-up based in Boston, raised $68 million in Series B funding for its cloud storage solutions. Wasabi says its cloud storage is 80% cheaper and 6x faster than Amazon S3, with 100% data immutability protection and no data egress fees. The company was founded by David Friend and Jeff Flowers, who also co-founded Carbonite. Wasabi says it has picked up over 3,000 customers in the past year. “The Series B financing will allow Wasabi to expand internationally, continue to invest in our brand, and enable us to compete for the largest storage deals in the world. Our objective is to make Wasabi into one of the world’s most renowned cloud storage vendors,” stated David Friend, Co-founder & CEO of Wasabi. Datrium, a start-up based in Sunnyvale, California, raised $60 million for its Open Convergence platform for cloud builders. The funding was led by Samsung Catalyst Fund, with participation from Icon Ventures, and existing investors NEA and Lightspeed Venture Partners. MACOM Technology Solutions will demostrate its PAM-4, Silicon Photonics and 64 GBaud products and solutions at next week's ECOC 2018 in Roma, Italy.